I’m a huge bookworm. It’s a problem. I’m forever buying, lending and recommending books. I can’t get through an airport without buying at least three and online bookshopping is something of an addiction. 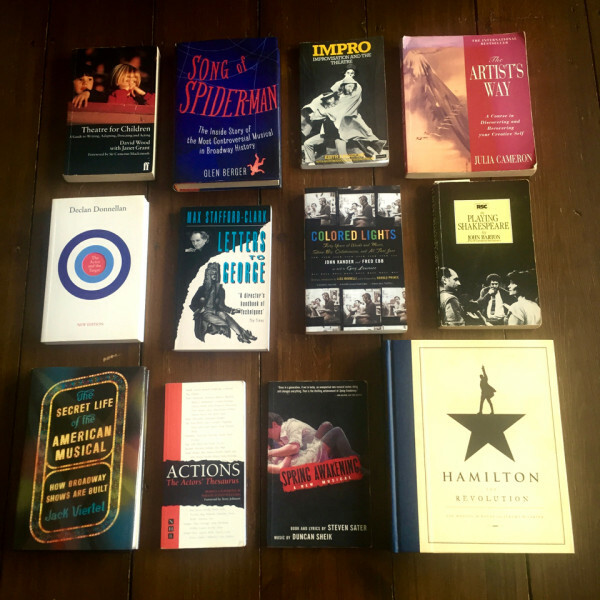 Maybe this post is just to prove that I really do read them all – but I wanted to share some of my favourite books about theatre and creativity. This is a wonderful book filled with ideas and provocations about what a responsibility and a joy it is to make theatre for little people. In 2012 I was asked to direct my first show for Singapore Repertory Theatre – David Wood’s adaptation of Fantastic Mr Fox. The team at SRT put me in touch with David and he very generously took me for tea and cake and filled me with inspiration about Roald Dahl, Fantastic Foxes, his incredible career and his beliefs about children’s theatre. At the end of the few hours we’d spent together he gave me this book with the advice ‘Listen to what Roald tells you in the text – the rest will follow.’ I’m now on show number six for SRT and making work for children is one of the most wonderful and important things that I do. 2) The Song of Spiderman by Glen Berger. An absolutely brilliant horror of a pageturner describing in gory and graphic detail the inside workings of the Broadway machine. As a person on the outside you can’t imagine how things can get to this level of crazy. Then you get up close and personal with the makings of a huge show and it all makes sense. Compulsory reading for anyone starting work on a commercial musical – and their loved ones who might have half a chance of understanding the bonkersness of it all after reading this. This one has been a staple of drama school training for as long as anyone can remember. In the 1960’s Keith was an Associate Artistic Director of the Royal Court Theatre and helped to run the Writers’ Group – fostering creativity and spontaneity using the techniques and exercises that he later wrote about in this book. It’s a really fascinating study of the nature of creativity and interaction, relationships and imagination – both in theatre and in life. This is not a book about theatre, exactly – Julia Cameron describes it as a course in discovering and awakening your creative self – but a fascinating workbook in creativity and authenticity. Its twelve week programme is pretty rigorous (I’ve started it several times but never formally made it to the end!) but the sense of possibility that it offers is wonderfully liberating. There’s a great sense of multi-discipline-ism (?!) throughout that has stayed with me – sometimes I will draw a picture for a choreographer or say to an actor ‘if it was a film, it would go like this…’ or similar – interesting starting points for conversation. This took a few reads to fully get inside – it’s a full and extremely detailed approach to playing a role and I’ve found some parts of it hugely useful in helping actors really dig deep into their characters. One of the great questions Declan asks is ‘In any moment what does the character stand to win? And what does he or she stand to lose?’ There’s also some great stuff about moving through a block in there too. I’m not sure this is a book for beginners but I’d definitely recommended it to professional actors and directors. This was on my A Level Theatre Studies syllabus and was one of the first books that invited me to consider the role of a director in a production. Whilst staging The Recruiting Officer in 1988, every night Max Stafford Clark went home and wrote about his day of rehearsal in the form of a letter addressed to the late George Farquhar, author of the original play dated 1706. It’s a gripping first hand insight into the process of a theatre director – it would be worth first reading Our Country’s Good and The Recruiting Officer to fully understand the references. Kander and Ebb are two of my favourite writers EVER. This book is an account of the major shows they wrote together from Flora The Red Menace through to The Visit. In reflecting on their work with such artists as Bob Fosse, Liza Minelli and Chita Rivera, this book gives the reader not only a history of one of the most incredible writing partnerships, but an overview of modern American Musical Theatre. Written in dialogue form, it’s an easy read which makes you feel like you’re at a dinner party with them – funny, fast and occasionally indiscreet! Completely charming. ‘Acting is built upon specifics’ urges John Barton – this is a classic book about how to interpret and perform Shakespeare and indeed any classical text. The Royal Shakespeare Company actors that John Barton works with and writes about are now our national treasures – Judi Dench, Ian McKellen, David Suchet, Patrick Stewart – and there is such a sense of care, nuance and responsibility throughout their work. It’s based upon a workshop video series that was produced by the London Weekend Television and there are times when it helps to get on YouTube and actually see the actors interpret the text – but Barton’s instruction on how to identify and play metaphor, clues, irony, antithesis and other signposts in the text is indescribably helpful to any actor. A must-read book for anyone working on new musicals – what makes a good musical, the nuts and bolts of how a show might be put together, what the elements are that contribute to that perfect whole. Jack looks at structure and form, examining the historical context of some of the more well known musicals as a starting point for discussion about how musical theatre has evolved and continues to evolve, serving its audience and pushing boundaries. It’s fairly esoteric – a knowledge of the canon will be useful in fully understanding his arguments – and well worth a read for anyone with an interest in new writing. He makes so many brilliant points about how an audience will connect with character, the different kinds of songs and where they should come in the show, and what an audience needs. So this one isn’t a book to READ, so much – but nevertheless one of the ones that makes it off the bookshelf and into rehearsal quite frequently! A lot of my work is with young people and as part of our daily warm ups I will look at technique. A popular one is a whistlestop tour of actioning – asking them to come up with words that can be put between ‘I’ and ‘You’ and then playing their discoveries across the warm up circle – we might discuss transitive verbs.. Or just make the list! The rule tends to be IF YOU CAN PLAY IT, YOU CAN HAVE IT (I lick you?! Sure.).. and then extending into chorus work, we might sing a section of ensemble music and all play a specific action. It’s a great way of unifying and calibrating a company with a varied background of experience and specifically chosen actions can be just the thing to unlock a tricky piece of text. Plus the bomnus feature – that for several days afterwards I will be accosted by random teenagers announcing ‘I TORMENT YOU’ in terrifying voices before scuttling off in fits of giggles. Highly amusing.. and they are absorbing technique by stealth. Winner. This is not the book pictured – when I directed Spring Awakening I lent it to Melchior and didn’t get it back – so the script is a stand in! Purple Summer is a short and sweet notebook style read in which Sheik looks in detail at the lyrics of each song and leads the reader to the sources, references, Bible Stories, myths and legends. I’m forever telling my students that they aren’t allowed to sing anything that the character wouldn’t create spontaneously in their own text, they must know the root of each lyric and so having so many references at our fingertips was a great resource for the cast and I. This encyclopaedia-sized book looks in detail at every single element of creation that went into making Hamilton – arguably the musical of our generation. It’s an exhaustive behind-the-scenes exploration of the making of a Broadway smash and has been made with astonishing precision and love. Some of the unique elements here include the text of every single lyric – with footnotes to show sources, rewrites and comments; interviews with the actors; drawings and reference details for the set and costume design; stunning first hand detail from Lin Manuel Miranda about the journey that this show took from concept to sell out Broadway hit. The photos are also phenomenal. So what’s next? 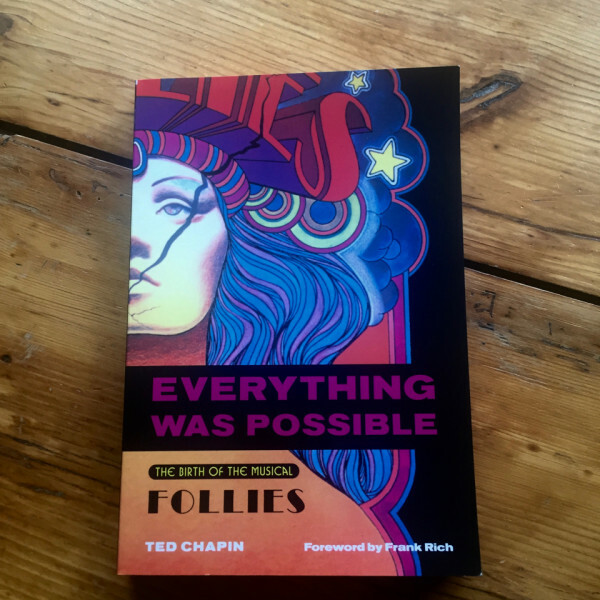 Well, I have a book about the making of Follies on my bedside table. Also the biography of the actual Mama Rose. A huge pile of scripts, Reasons to Stay Alive, Sue Townsend’s The Queen and I, and a book about Neuro Linguistic Programming. I’ll start them all and get back to you in a year. 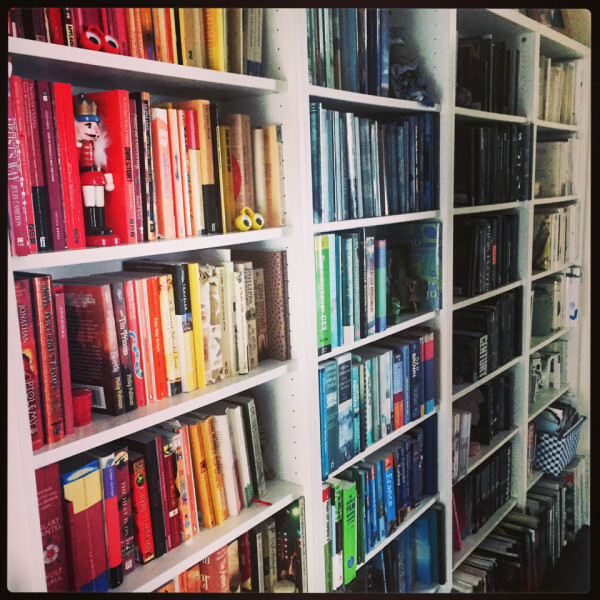 Did someone say I have a book obsession? Previous post We love new musicals!